Put the things you are selling into the striking position of your site. Don’t swam your site with graphics and unnecessary elements! 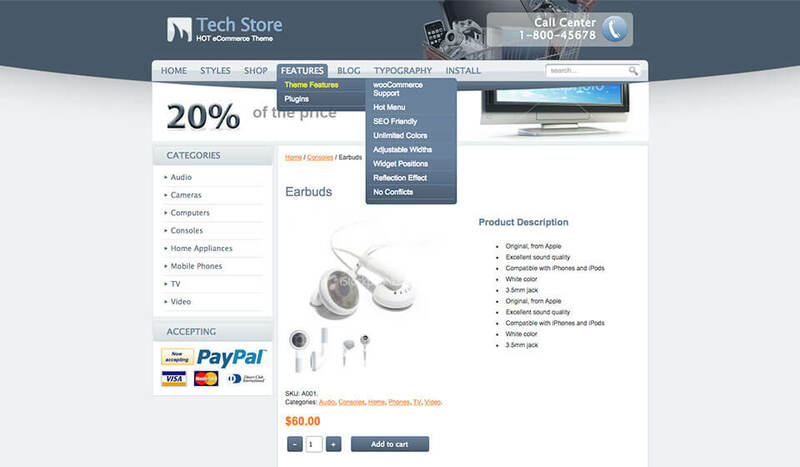 Ecommerce WordPress theme should allow your visitors a quick and easy online shopping. 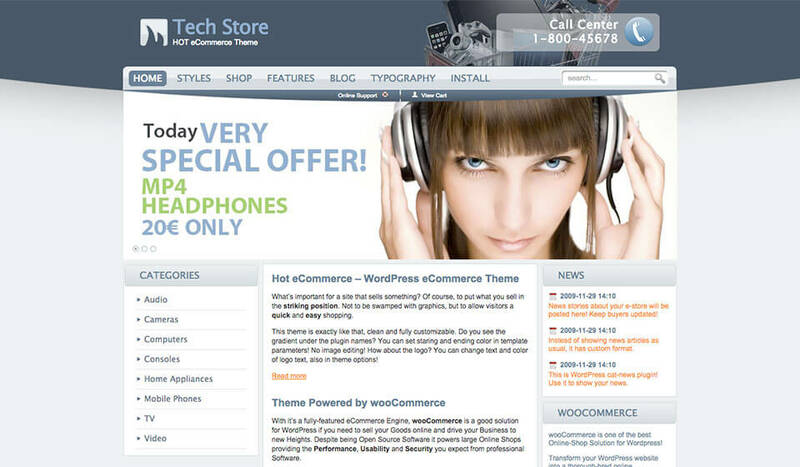 This WordPress theme is exactly like that, clean and fully customizable. Do you see the gradient under the plugin names? This is not an image. It’s CSS3 code! You can set starting and ending color in the theme options! No image editing! How about the logo? You can change text and color of logo text. Everything is in the theme options! This is multipurpose Ecommerce WordPress theme. However, our demo is filled with technical products, such as audio and video equipment and hardware. 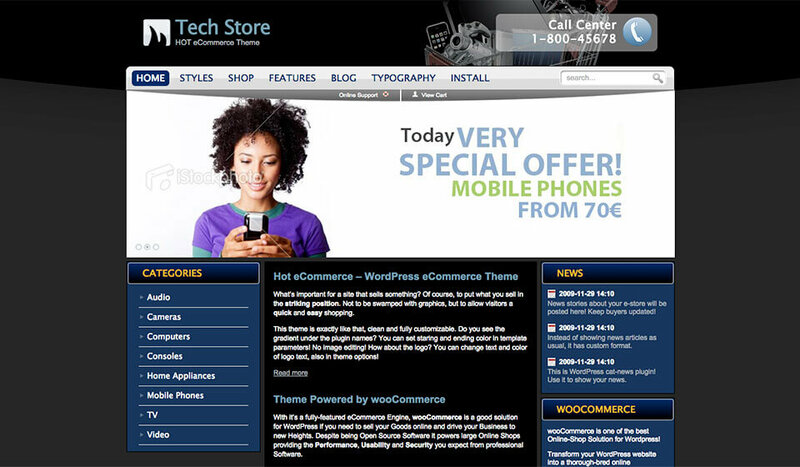 The theme’s neutral design allows you to use it for any kind of web store. 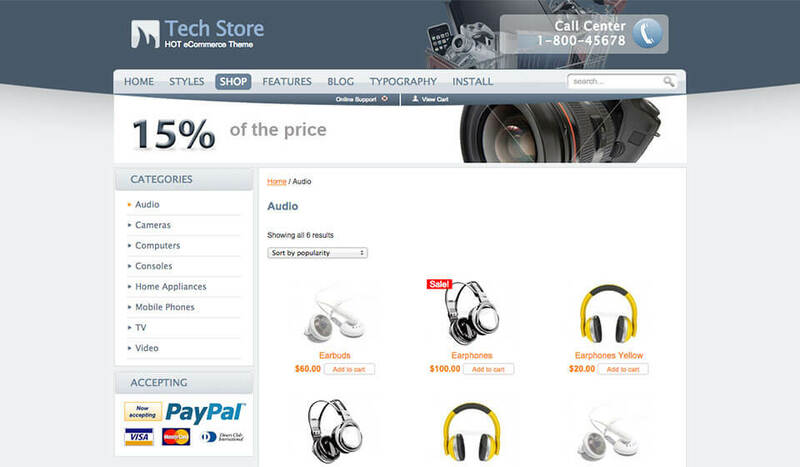 That’s why we named the theme with so generic name: Hot eCommerce! wooCommerce plugin is natively supported by this them. If you install it using the HotStart installation method (which is highly recommended), you would get an eCommerce website instantly! Then you simply change our demo products with your real products, you are ready to launch your site and start selling your products! We have also included 2 in-house plugins for slideshow. We believe the Hot Effects Rotator plugin and the Hot WordPress Gallery plugins will be useful. 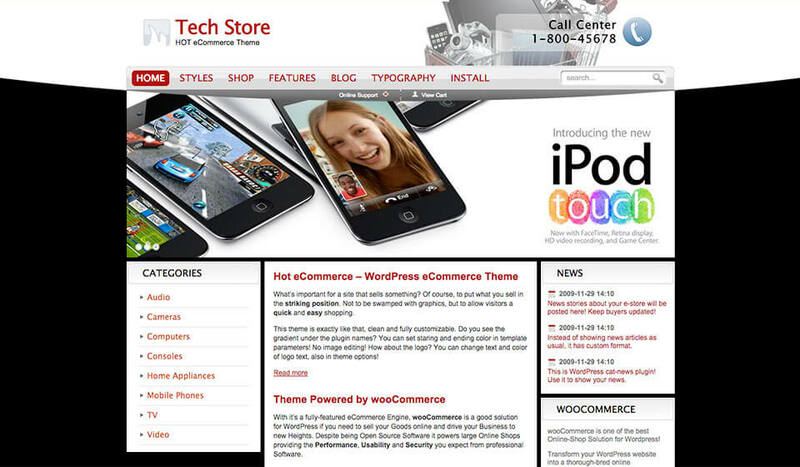 This Ecommerce WordPress theme comes with 5 pre-defined styles. These styles have different colors. However, all colors, including the gradients are easily customizable from the theme options. You have infinite color combination in Hot eCommerce. All parameters available in this theme are located in a dedicated page of your WordPress Dashboard. You can access it from Appearance > Theme Options. Each theme has different set of options related to font and background colors, widths of the elements and features that can be enabled or disabled. 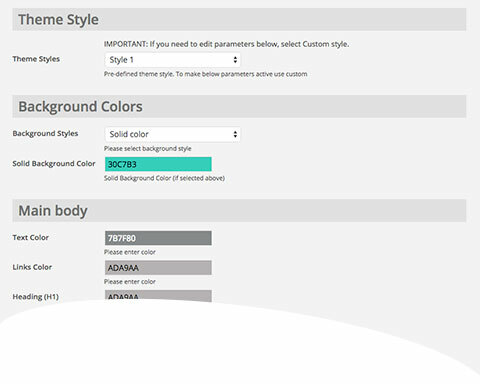 From the Theme Options panel you can select active color style of the theme or create your own color combination. wooCommerce is the most popular plugin for e-commerce WordPress sites. This theme relies of this plugin and fully supports it. 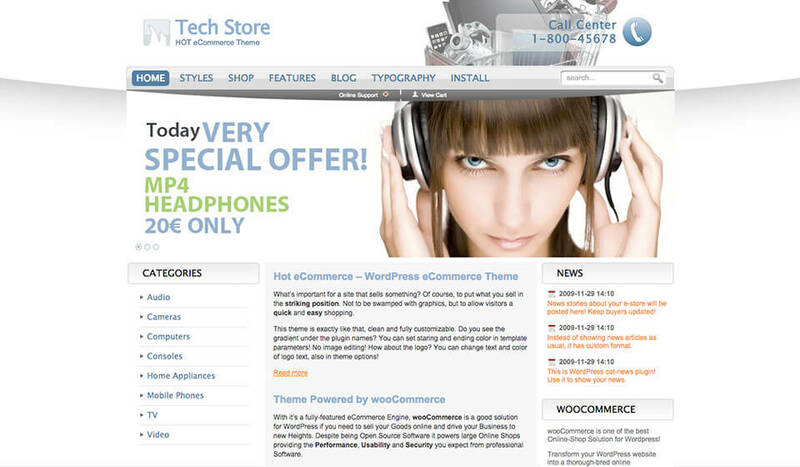 This theme supports wooCommerce e-commerce plugin for WordPress. 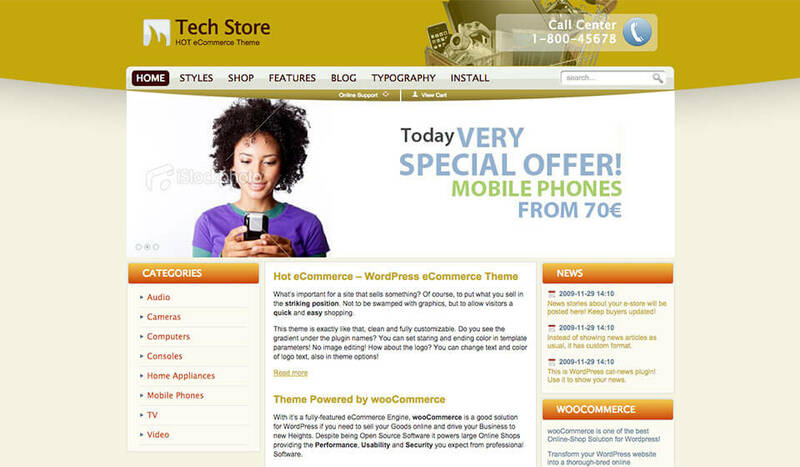 It allows you to make your web store just by installing the theme. Start selling now!